Our recent blogs have reviewed some procedures that can give you newfound confidence in your smile. You can find more details about these treatments with the articles below. To schedule a personalized consultation to discuss your smile, visit John Carson, DDS in Tucson. Call (520) 514-7203 or go online to schedule your first appointment. 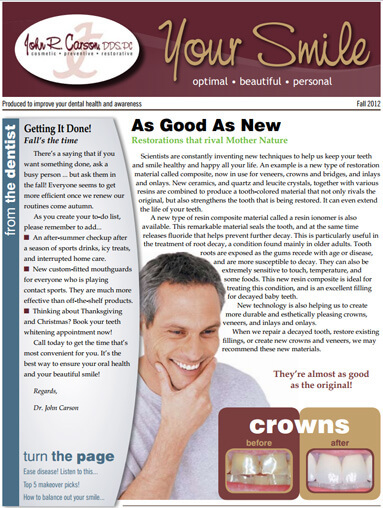 Check out MSN.com for a look at the causes of yellowing teeth and treatments to brighten them. The American Academy of Periodontology explores the effects of aging on the teeth and gums. Find out which materials are best for dental fillings at WebMD.com. HowStuffWorks.com explains the development of cavities in this helpful article. 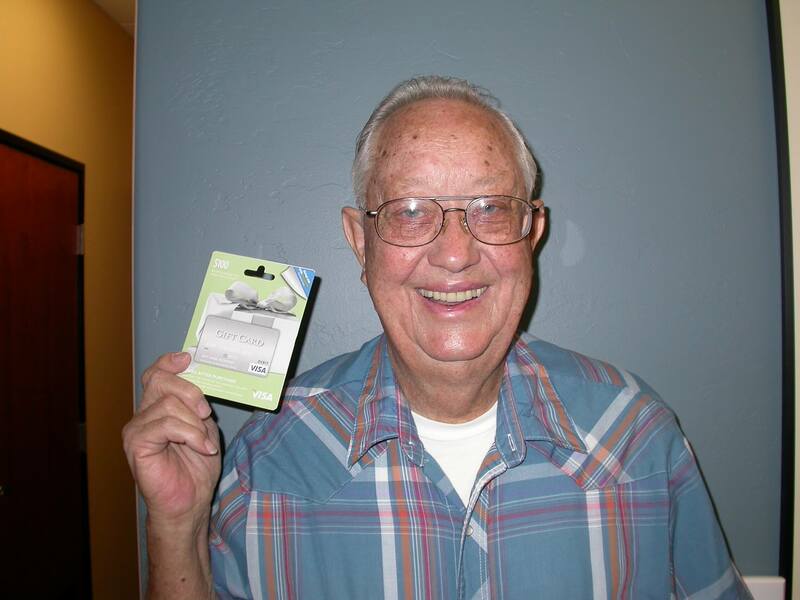 Congratulations Lacy S. our August 2012 $100 Winner! Cavities are a problem commonly associated with children, but they often appear in adults as well. When cavities are spotted early enough, they can be treated through changes to a person’s oral hygiene routine. 1. Diagnosis of the cavity: Your dentist may use screening such as laser cavity detection with DIAGNOdent or digital X-rays to assess the exact size of the cavity. Once the cavity is identified, the dentist can recommend the most beneficial treatment for your individual case. 2. Cleaning and preparation of the tooth: Before a filling is applied to the tooth, the dentist will prepare the tooth by removing any decayed portion and shaping the remaining structure for the filling. Preparing the tooth for the filling helps to ensure that a strong bond can be made, which will keep the tooth strong and functional for years with the filling in place. 3. Filling with composite resin: There are many different materials that have been used for tooth fillings, but none offer the same aesthetic appeal and durability of composite resin. Composite is a tooth-colored mixture of materials designed to mimic the look of natural teeth while offering the same strength as a person’s own tooth enamel. If you have a cavity disrupting the appearance of your smile or causing you discomfort, schedule a consultation with Dr. John Carson, DDS in Tucson. Our advanced dental practice offers the latest technology available for diagnostic dentistry and dental restorations. Schedule an appointment to see how this technology can benefit you by calling (520) 514-7203 or visiting our website. When you get older, you may need to change your dental hygiene routine to keep your teeth and gums healthy and beautiful. The aging process can lead to many changes in the anatomy of your smile, and a few of these changes are discussed in this video. Watch this short clip to educate yourself about the effects of aging on your smile and oral hygiene. As this video shows, older individuals face a higher chance for gum disease, tooth discoloration, and dry mouth, which can all be addressed during a visit to your dentist’s office. To get the specialized care you need to keep your smile bright and healthy, contact the office of Dr. John Carson, DDS by calling (520) 514-7203 or visiting our website. We offer the most innovative dental care technologies available to create beautiful smiles. As you get older, you will notice that the first signs of aging tend to appear in your facial expressions, and more specifically in your smile. Your teeth and gums are always changing, and you may find that advancing age has your teeth lacking the brightness and sheen that they once had. Cosmetic dentistry can help to revitalize your smile so that you don’t give away your true age when you show off your pearly whites. Below is a look at some of the positive effects that cosmetic dentistry can have on an aging smile. Improvement in tooth color: The teeth are highly prone to yellowing over time due to the prolonged effects of consuming tooth-staining foods and beverages. You can see a significant change in your tooth color and brightness by opting for teeth whitening. Nearly instant results can be achieved through in-office whitening procedures, while gradual whitening effects will result from at-home whitening kits prescribed by your dentist. Reduced likelihood of gum disease and tooth decay: Cosmetic dentistry does more for your teeth than improve aesthetics. Through various cosmetic procedures such as implants, bridges, and crowns, your dentist can remodel your smile so that daily cleaning is easier and more effective. Many of these procedures will also reduce the chances of tooth decay and gum disease developing, meaning that your smile will look beautiful well into the years ahead! Repair of existing problems: If you suffered an injury to your teeth earlier in life, the previous restorations to your teeth may be outdated or in need of replacement. With the modern procedures offered in today’s cosmetic dentistry practices, you can get an update of old restorations while improving the rest of your smile with veneers, same-day crowns, or dental onlays. Start planning your cosmetic dentistry makeover today by scheduling a consultation in the office of Dr. John Carson, DDS. Contact us on our website or call us at (520) 514-7203 for a closer look at the services we offer.